An ancient remedy for modern times, acupuncture is a therapeutic method used to encourage natural healing, reduce or relieve pain and improve the function of affected areas of the body. Acupuncture is safe and effective, often providing relief when traditional medical treatment has failed. Treatments involve the insertion of very fine sterile needles through the skin at specific points on the body. There is no injection of any substance and the treatment itself causes minimal if any discomfort. 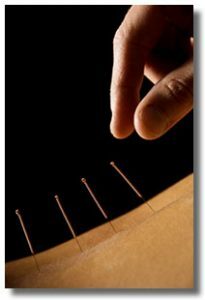 One of the most striking aspects to acupuncture is the almost complete absence of side effects from its use, and one doesn't need to believe in acupuncture for it to work. Acupuncture stimulates the body to produce its own pain relieving chemicals called "endorphins". These chemicals attach to receptor sites found throughout the nervous system, and help to block pathways that relay pain messages from the body to the brain. The improved energy and biochemical balance produced by acupuncture stimulates the body's natural healing abilities, reducing inflammation, and promoting physical and emotional well-being.